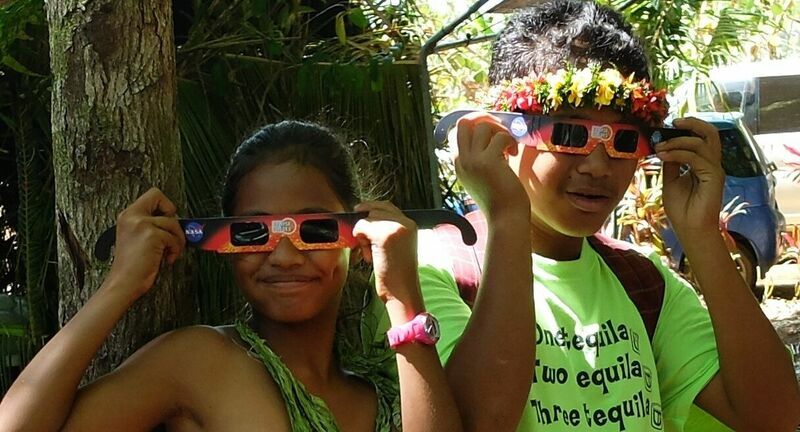 The Exploratorium in San Francisco collaborated with NASA and the National Science Foundation to produce a live broadcast of the total solar eclipse from Micronesia on March 8/9, 2016. The fully eclipsed sun was visible from only a few Pacific islands, but our live broadcast made this amazing phenomenon available to millions of people around the world. The “path of totality” for an eclipse is the area on Earth where people can see the moon fully covering the surface of the sun. It is only 100 miles wide and moves in a curved path across the globe. The 2016 eclipse was visible for a short time at sunrise in Indonesia; then the path crossed the Pacific Ocean and made landfall at only a few atolls, including Woleai. The Exploratorium sent a team to Woleai to film and broadcast the event. Educators, students, and the general public witnessed a live program and telescopic views of the sun through the Exploratorium’s Total Solar Eclipse website, the Exploratorium’s Explo TV media portal, a new Total Solar Eclipse app for Android phones and tablets, and a new Eclipse blog. 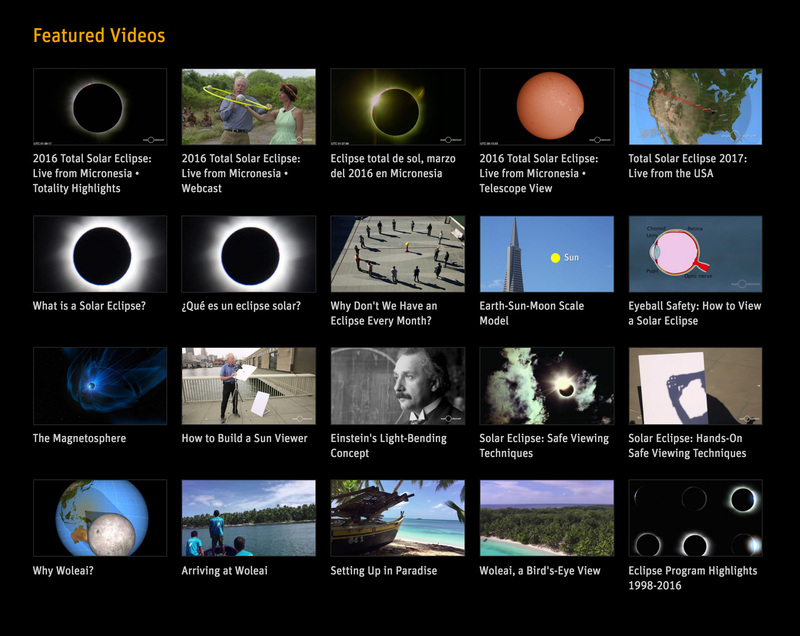 Since 1998, the Exploratorium has produced five highly successful live eclipse programs that reached an international audience of millions through the Internet, NASA-TV, and other media outlets. Our broadcast feeds have been shown in more than 100 NASA Learning Centers and in science museums around the globe. 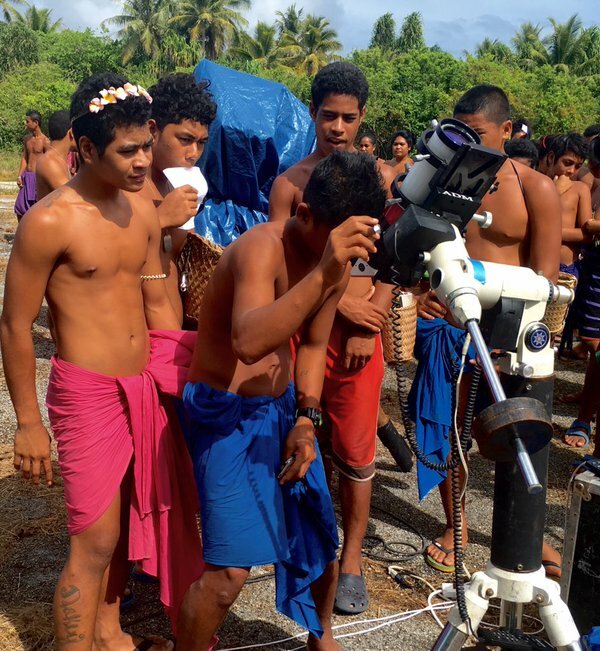 The Exploratorium produced a one-hour program that includes information about the eclipse and safe viewing techniques, and explored the Micronesian island we broadcasted from. It featured stunning live eclipse imagery from four telescopes (1/4 disk and full-disk in white light and with H-Alpha filters). The program explored the science of the sun, using amazing, high-definition images and video from NASA satellites such as the SDO and STEREO missions. It highlighted NASA’s new MMS mission, a multi-satellite endeavor to measure the magnetosphere that connects the sun and Earth. This program included live Closed Captioning for Internet audiences. We created a third feed, a shorter version of the telescope-only feed, with live Spanish narration provided by Exploratorium scientist Dr. Isabel Hawkins. An additional version of the telescope feed had music composed in real time by Exploratorium composer Wayne Grim created by “sonifying” the eclipse image data. 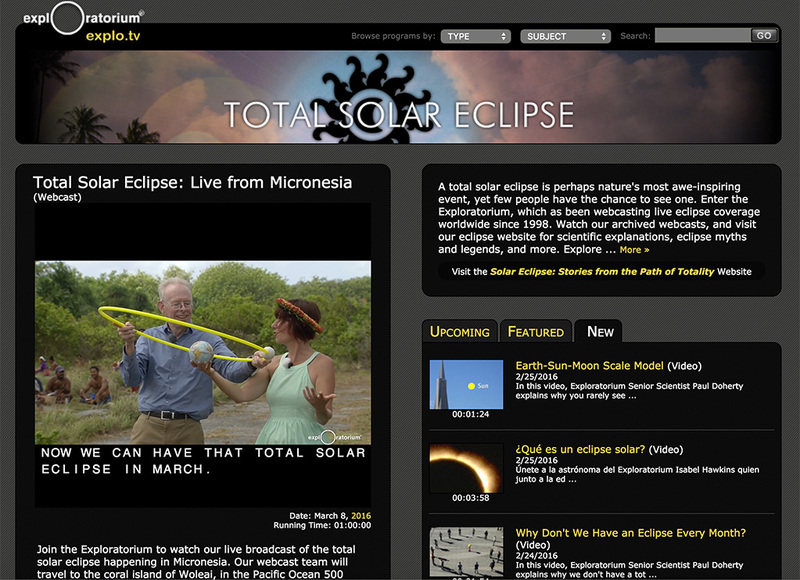 The Exploratorium’s website and social media channels provided eclipse information and dispatches from the broadcast team leading up to the event, allowing audiences to explore eclipse and solar topics through articles, online exhibits, and links to other Exploratorium online resources. 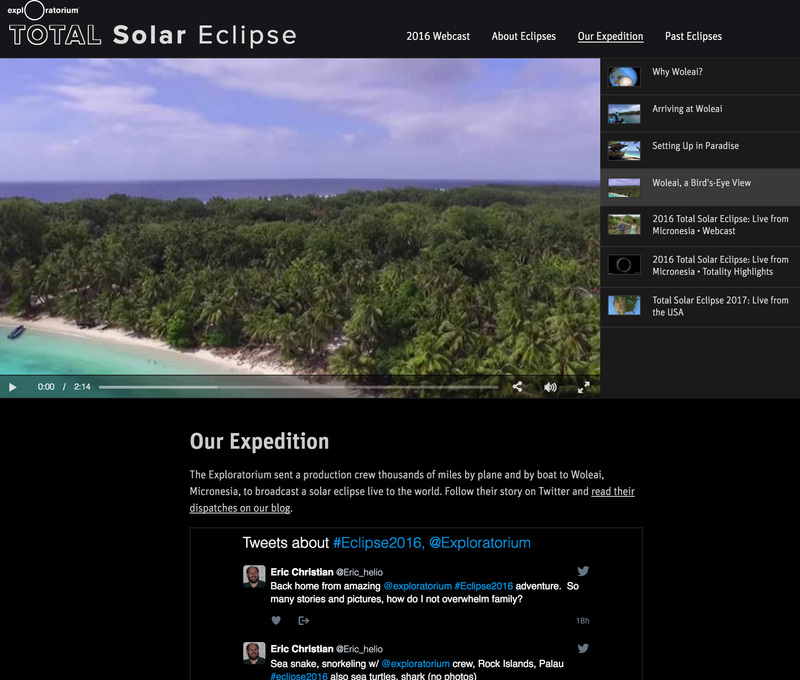 After the event, the website presented an archive of the 2016 expedition content—and the Exploratorium’s preparations for Eclipse 2017, whose path of totality will pass over North America and be visible to millions. 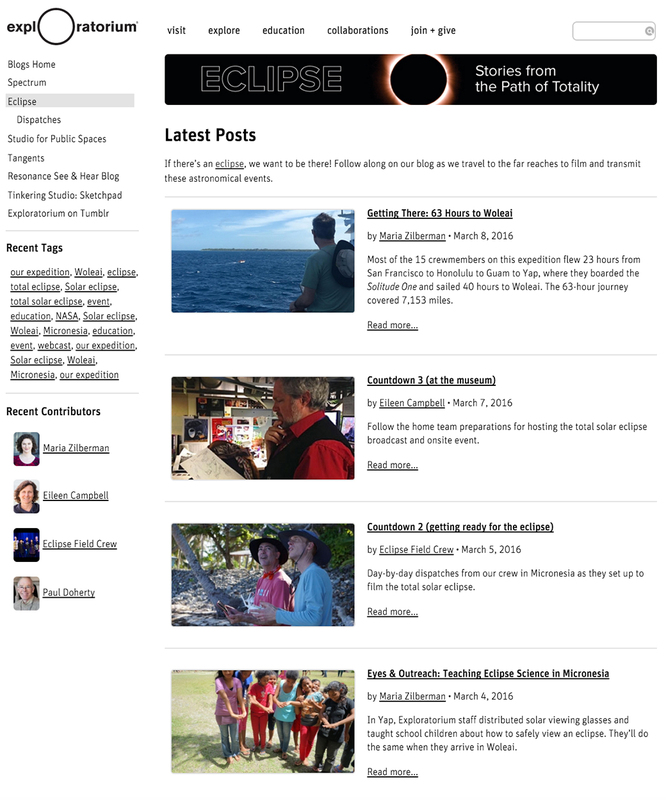 The Total Solar Eclipse website’s Expeditions page featuring updates from current expeditions, videos, blog posts, and tweets. The Exploratorium Eclipse Blog features updates about current eclipses and expeditions, latest updates about viewing live streams, and dispatches from the expedition crew. 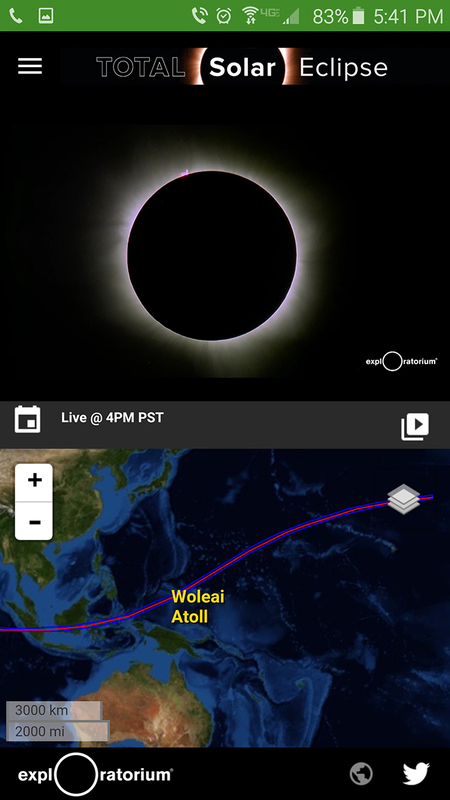 A screenshot from the Total Solar Eclipse Android app during the eclipse on March 8, 2016 with live telescope view and interactive map showing Woleai in Micronesia and the path of eclipse totality. 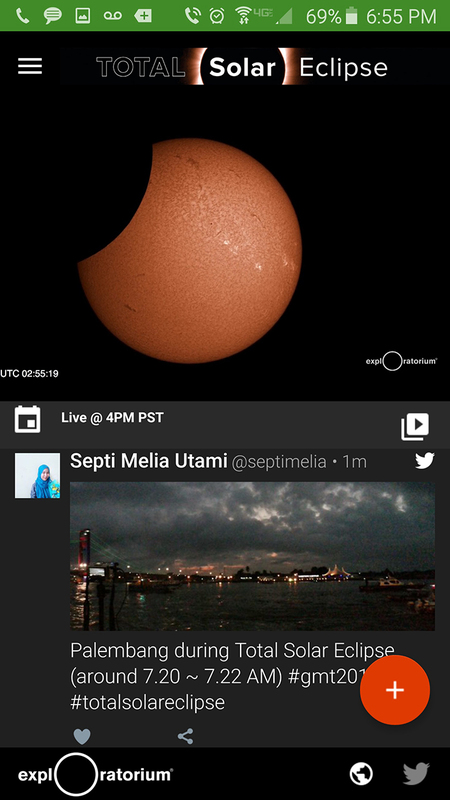 The Total Solar Eclipse Android app showing live video view of the eclipse on March 8, 2016 from Micronesia with tweet from eclipse watcher in Indonesia. To help make our program accessible, we offered live closed captioning for the webcast program on both our website and Total Solar Eclipse Android app. 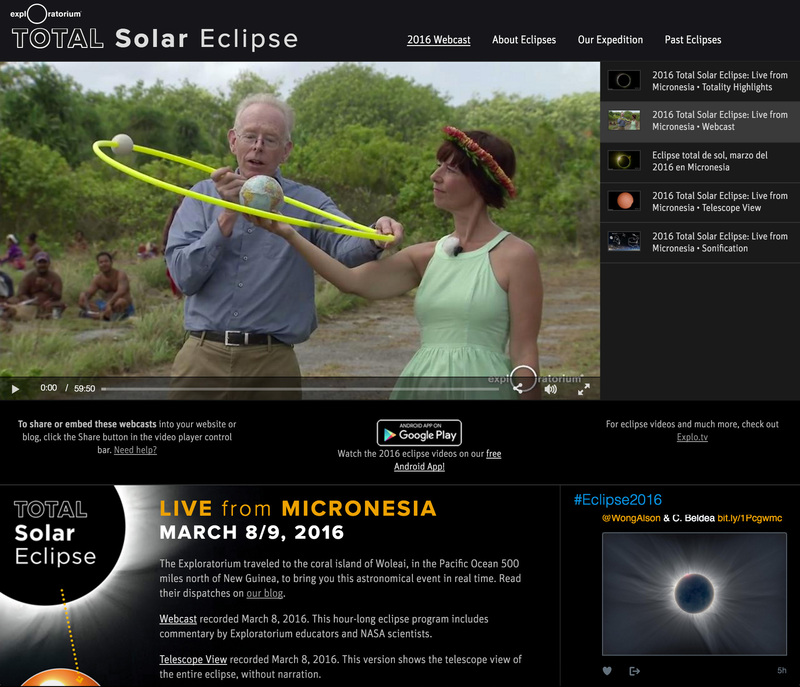 Total Solar Eclipse: Live from Micronesia webcast with live Closed Captioning as seen on the Total Solar Eclipse channel on Explo TV–the Exploratorium’s media portal website. We experimented with two additional distribution methods. 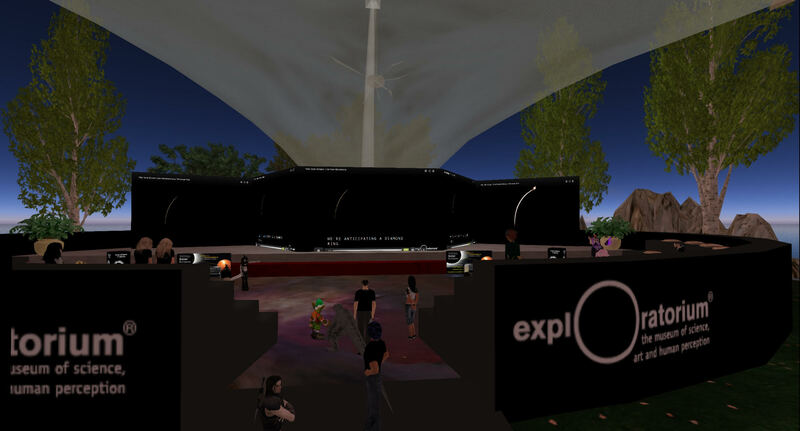 One was a mixed-reality event in Second Life which featured live streaming of the eclipse webcast and telescope video into two different locations in that virtual world (Exploratorium Island and Science Circle). 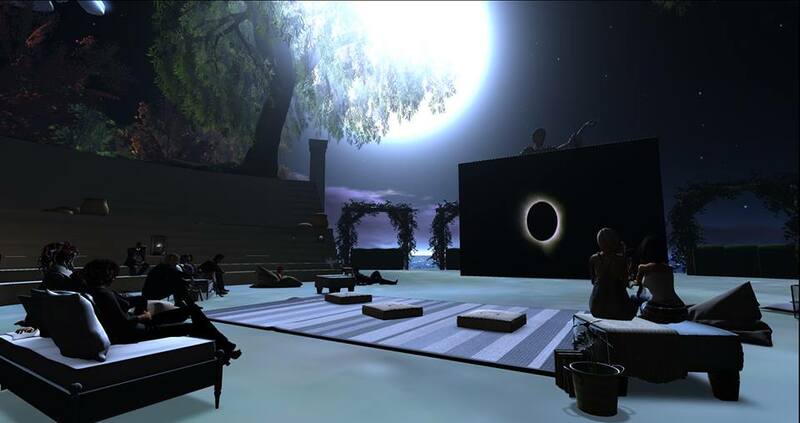 Avatars from around the world gathered in these two locations to watch the eclipse together. A set of companion interactive exhibits about eclipses and about the expedition to Micronesia was available on Exploratorium Island. The other distribution experiment we did was to multicast all four live video streams to research and education networks (like CENIC in California, NYSERNet in New York, and other regional high-speed/low-latency networks in North America that are interconnected with the Internet2 consortium’s network infrastructure). Multicast video streaming is typically visible to students and staff at higher education institutions and provides a cost efficient method for sharing to many users. We used the Session Announcement Protocol (SAP) to advertise the streams in advance and worked with CENIC and Internet2 to promote the live webcast multicast access. After the event, we streamed an eclipse totality highlights video and the full 1-hour educational webcast on a loop via multicast.